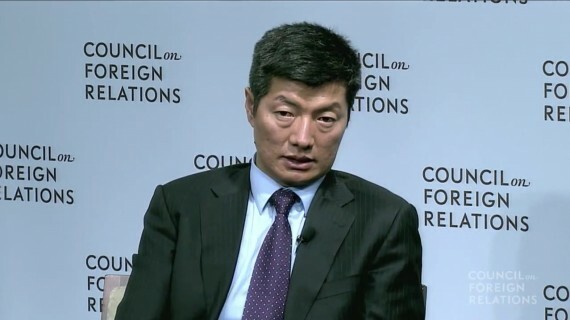 On May 8th, the Council on Foreign Relations in Washington hosted an evening with Lobsang Sangay, the head of the Tibetan government in exile. Sangay addressed a gathering of journalists, academics and lawyers, eager to discuss the escalating crisis in Tibet. (The proceedings were recorded and the video is available online). Most in the audience anticipated a repudiation of Chinese Communist rule from the Harvard Law student, but what Sangay had to say sent shock waves through the room, and later, the blogosphere. To embrace Chinese Communist rule is to abandon the people inside Tibet who have waged a desperate battle of survival and resistance for over 60 years. Every man and woman who made the ultimate sacrifice of self immolation did so for independence, as their moving final testaments confirm. And it is in direct opposition to the stated goals of the Dalai Lama, who purposefully modeled his exile government on India’s democracy, not Mao’s one party dictatorship. When the Dalai Lama proposed the Middle Way Policy in 1988, he conceived of preserving Tibet as a buffer state and a de-militarized “zone of peace.” Sangay’s stated position eviscerates the relevance of the Tibet movement, and depreciates India’s burden of a long, tense border with an increasingly bellicose China. There were Indian journalists present at the Council on Foreign Relations that evening, but none asked Sangay any tough or serious questions. When the matter of the recent Ladakh incursion was raised, Sangay blithely said that China’s military positions at the Indian border should be at “China’s discretion.” Excuse me, but Sangay resides in Dharamshala, and has recently been provided with a special vehicle with a red light on top, to indicate his VIP status in Himachal Pradesh. One would assume that these privileges come at South Block’s discretion. There are some features of pre-communist Tibetan political culture that Sangay is actively deploying to build his myth; his official Facebook page declares that he is a “secular emanation” of the Dalai Lama and Guru Rinpoche. And at the Council in Washington he said; “Many artists inside Tibet have composed songs in honor of the election and my victory and they have put it on YouTube with English translation. Some have sent me scrolls where normally we put deities and gods and goddesses, only they have put a picture of me and that’s being distributed.” This would be risible if not for the mounting death toll in Tibet, and that Tibet’s ancient civilization is being destroyed by the day, as bulldozers tear into the holy Jokhang temple in Lhasa. Beijing’s cadres are unwilling, or unable, to relinquish one party rule, as they cling to an obsolete Maoist world view that demonizes the Dalai Lama and calls the Buddhist faith “a disease to be eradicated.” That Tibetan culture is a force that so petrifies the great People’s Republic of China exposes the xenophobia, intolerance, and violence that infects the Maoist creed. Sangay’s categorical rejection of democracy in favor of Communist rule in Tibet could be a cynical power play, or maybe he thinks might makes right, and that power does come from the barrel of a gun, but then, how can he proclaim himself a secular emanation of Avalokiteshvara, the Bodhisattva of Compassion, protector of Tibet? While the last words of Phangmo Dhondup, who self immolated in Tibet last February, were: “Without independence Tibet will be annihilated”; while the Chinese bulldozers are razing to the ground the entire area of the Barkhor in Lhasa; the Sikyong Lobsang Sangay continues in his delirium in favour of Chinese Communism. I hope that TNC will identify soon a candidate pro-Rangzen for the next general elections that are going to see a crucial battle between the “Two Lines” now irreconciliable. A quarter century of rigid and increasingly desperate attachment to the categorically failed “Middle Way” policy has led to this absurd but ultimately predictable dead end. As the function of a policy that was the ever more fevered symptom of a government in negotiation against itself, it was almost inevitable that the rhetoric of the CTA would increasingly ratchet toward the extreme position of the CCP, the constant in this dismal equation. When the Sikyong publicized “We are not asking that democracy be implemented or be allowed inside Tibet” it hardly need be said that this was neither the “Middle” nor the “Way”. Rather, it was the death throes of a policy that could no longer even lay claim to its own name. At the ‘COUNCIL on FOREIGN RELATIONS’, the ‘Obvious’ setting & statement made by Mr. Sangay is no mistake, but an agenda unfolding it’s self. Y’all please watch this short video for an insight. Well, our Sikyong has said what he had said in line with the CTA’s objective which is to always leave the possibility of fluid dialogue with Uncle Chin open and receptive. That’s why I also say MWA is the best proposal in the long run because it is mutually beneficial to both entities. What’s the point of making a lot of noise against an entity who holds the STICK. We want chopsticks instead. Today the world’s sole-superpower has its hands full with the bellicose Kim Jong Un, let alone Iran. So, what’s the point of Dharamshala making making some temerarious noise against Uncle Chin who has lifted over 680 million Chinese from depths of poverty in the last three decades, according to statistics compiled by some US firms as reported by Fareed Zakaria on CNN. That’s a fact. As far as I am concerned, Sikyong couldn’t have said it any better in light of the current political status quo we are in; sounding like a seasoned diplomat rather beating a drum without much gumption, to say the least. To me his words resonate with a high degree of acumen and sagacity in pledging for leniency consistent with per Chinese constitution. As for demolition of Bhakor area, I believe, it is our own making in a way, with self-immolations, etc. Some of the twenty thousand Uyghurs (10k in Sinkiang and 10k in exile)made a lot of noise and the result was similar to the Bhakor demolition a few years back in the capital of Xinjiang. Baba Phuntsog Namgyal learned the hard way as to how vocal he should have been in the past. When Hu Yao Bing had approached him during their three hour discussion in his kitchen over tea to be the man in charge of the TAR, he deftly but politely declined the invitation, cause age and intuition had taught him to tread very carefully. My guesstimate is that the 10th Panchen Lama wasn’t careful enough buoyed by his intense love of his land and people and the Dharma. In the ’60s a leader of a superpower made a lot of raucous noise in the UN’s General Assembly. Taking off his shoe and banking it at the podium Nikita Khrushchev roared of the West, “We will bury you!” The point I’m trying to make here is that making a lot of empty words can be toxically counter productive. Pardon me. A slight error in regard to the population of Xinjiang which should have been in millions not thousands. @ajo che: Ah! The Sikyong & Uncle Chin, now it makes sense. In our previous history we had Ngawang Jigme, & the history repeats again. Yo, CTA might as well reveal it’s true intention as the Chinese Tibetan Association or the Communist Tibetan Association = C.T.A. FYI, “Signs & Symbols Rule The World, Not Words Nor Laws”-Confucius. COUNCIL on FOREIGN RELATIONS or C F R.
Y’all please don’t take my word for it & do your own re-search or homework, because it’s all there if you look. The Sikyong does not so much “embrace Communist rule” in China as he feels compelled to acknowledge its existence as a currently unalterable reality. He knows that to stand in direct opposition to a bully of China’s stature invites deeper persecution on Tibetans. He also knows that China can’t wait for such opposition. Put simply, every time any authority figure outside of China tells China what it MUST do on anything, the Chinese Communist Party smiles with glee and issues it’s usual shrill rebuttal. When it comes to Tibetans, this rebuttal is generally followed by increased repression on the ground. China is looking for every opportunity to tell the world that it’s a new day and that they are fully prepared to follow no advice but their own. Our direct challenges repeatedly give them the platform they need to re-affirm their beliefs to the world through their rebuttals. We saw this in Nepal. The ill-conceived attempt by the International Campaign for Tibet to draw attention to Nepal’s failure to live up to the “Gentleman’s agreement” which allegedly guaranteed Tibetan safe passage through Nepal and on to India, provoked China into pressuring Nepalese authorities to clamp down hard on the Tibetan community. Chinese ambassador Yang Houlan even went so far as to blame “outside, Free Tibet” groups for the brutal crackdown. Do we want to trumpet our political ideology as being superior to that of the Chinese, or do we want to save Tibetans? We’ve been prioritizing the former for the last two decades and it hasn’t been working.